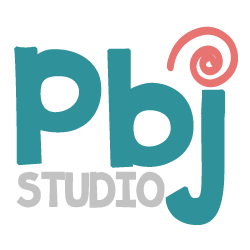 Posts with tag: "PBJ Studio"
This spring I changed my business name. People ask why and I provide the short answer, "It is easier to remember". But the real answer is that I am different and my business goals have changed. This is a new beginning for both me and my work. Everyone was telling me that my building needed a sign: my friends, family, clients and the Eudora City administration. So I collected estimates on what I thought I wanted. I drew pictures of what might work. I dug through the internet to see what others had done. But it all changed one day in a town hall meeting (folks need to attend these if they can). 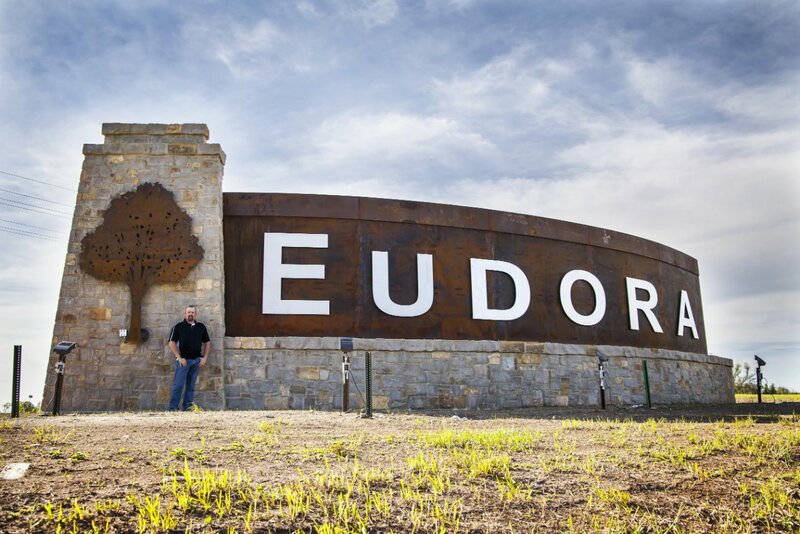 They were talking about Chad Musick and his work on the sign east of Eudora off K-10. I quickly wrote Music in my notes and determined to find him. I dug around Facebook and found J & S Metal Art. This is the work of Junior and Sharon Musick who are creating metal arts to market at local craft shows. It felt like a lead so I messaged them. 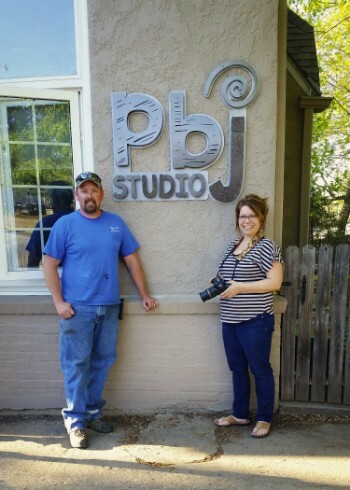 Little did I know how important their son Chad, his wife Shaun and their business Metalneck Creations would become in establishing my PBJ Studio identity in our business community. In our first meeting at the studio, we talked about my goals as a photogra pher and the image I wanted to present. I showed them where I thought the sign could go on the building. After settling on a price estimate, I emailed the logo. He came out a couple more times, brought samples of different types of metal and discussed some additional ideas we both had for creating shadow and impact. If I had an idea, he was willing to do what he could to make it happen. The entire process was really quite simple. When everything was settled, I was invited to come and watch it all happen. 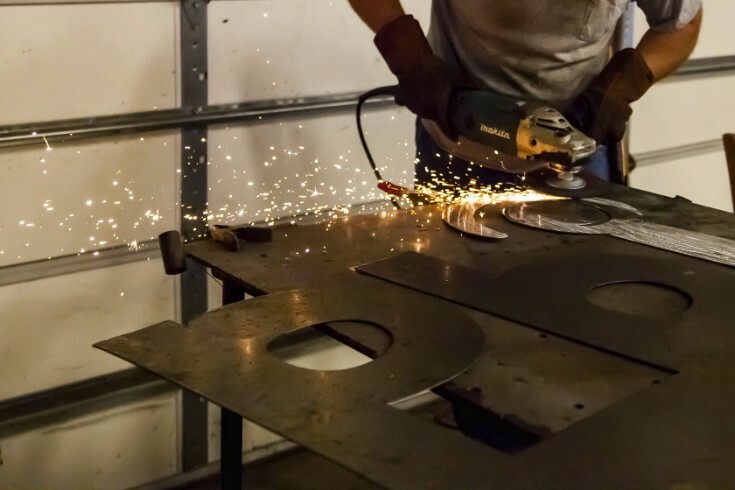 Chad creates his designs in the Musick Family barn; a place where metal becomes art. It is clutter and rust. It is fire and water. The laser sparked and within a minute I could identify the first letter. Tears filled my eyes. It was more than the intense light (or just being hormonal) -- it was seeing something I'd dreamed up from imagination, birth into a beautiful and solid reality. This sign means so much more to me than you could ever imagine. Today, the waiting is over. Seven years of learning and yearning to be all that is possible for business and photography has come. From now on, I will walk, and talk, and be, and see all that is possible. Today, a sign will be placed on this building that i walked past for 7 years and dreamed of it being a studio. A sign that says that all things are possible when we wait and pray and seek and trust. It will not be easy. I will work harder than I ever have and push myself out of my comfort zone into a place filled with new and wonderful sights and sounds. I will stretch. I will grow. I will fill this space I've been given. Thank you for making this a reality. Can you tell that I'm just a little bit excited? Congratulation on the next step of your journey. I hope the sign meets your expectations of the symbol it represents. Did this sign meet my expectations? Not at all. This sign blasted far past what I imagined! It is such an amazing example of what is possible in our community when we work together. Thank you Metalneck Creations, thank you Musick family, thank you clients-friends-family who have been there with me on this often-time difficult, yet so rewarding, journey. I am here, doing what I love, and succeeding in it, because of you. 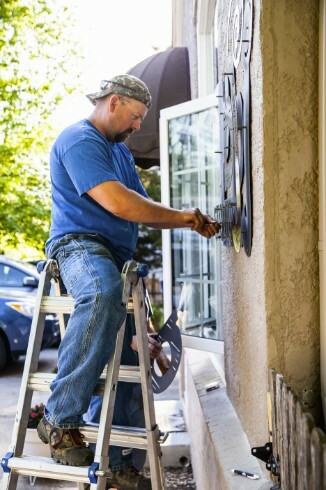 Please Note: Chad doesn't accept hugs from overly-emotional business owners after a sign installation, but his wife, Shaun, is available to do so. This blog post will set the clock on publicly beginning my journey into a world filled with laughing children, crying babies, and crazy prop finds. First stop, two Name Change Announcements! 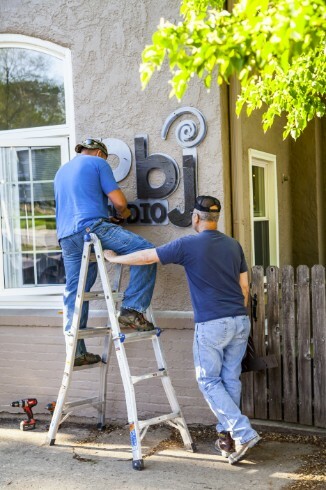 Top Spot Photography is now PBJ Studio. I won't immediately be killing off Top Spot Photography, but it will slowly fade away so I don't confuse anyone. The reason behind the decision has to do with where I'm focusing my future. I love working with children. I love retro 1950s (turquoise, coral, gray branding). It is the acronym for Photography by Janene (PBJ). Most of all, it makes me happy. The other name change announcement is even closer to my heart: my name is now Janene Rothwell. It was my name for the first 19 years of my life and I am happy to return to it. I'm still 9 years old in my heart so that is a great place to go. I Googled and found a form for brides to keep track of all the places where they need to register their new names. It really isn't fair that guys never have to go through this mountain of paperwork. When I consider how long things last on the internet [FOREVER], I will need to include Top Spot Photography and Janene Snyder on every search engine SEO that I use. If you don't understand that, you are in a wonderful place where butterflies land on your nose and it smells like warm cinnamon rolls (I used to live there 50 lbs. ago). I will be photographing baby bumps, newborns, toddlers, children, seniors and families. I am contracted with Amanda's Dance Academy (The beauty of the dancers takes my breath away). Life Events such as birthdays, anniversaries, adoptions, personal celebrations, etc. are also on my radar. Weddings/Engagement sessions will not be on my PBJ plate. Construction: Last week, I had the awning installed. *happy dance* On Monday, the concrete guys will install the porch with rails and a ramp for the west door. 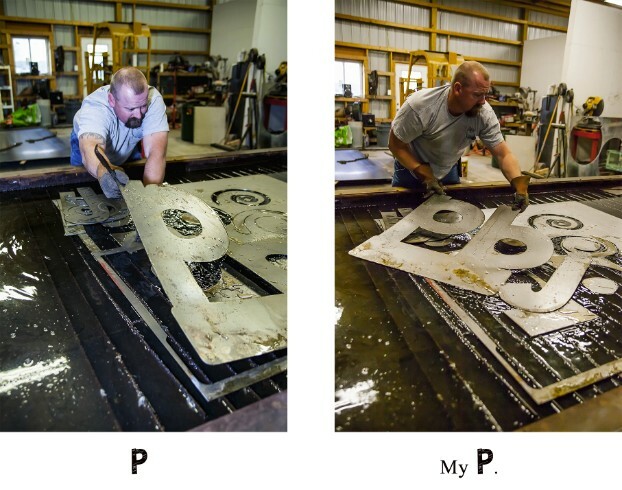 I listened to you and will find a sign installer. FYI: It won't say Top Spot. Internet: New website is running which will soon have a splash page where you can head to the STUDIO side, the BABY side or the BLOG side. If you type the Top Spot URL it just rolls over to the PBJ one. I told someone recently that my mind is doing the work of a trapeze artist, but sadly, I don't get to burn the calories! 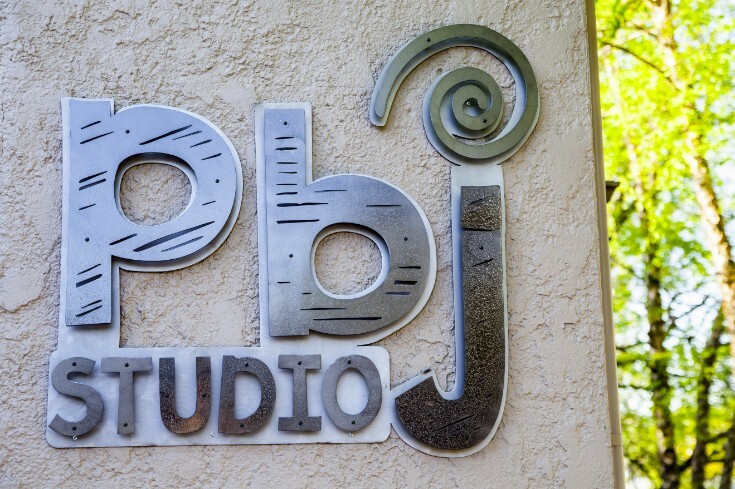 To find the awesome new site, go to: www.pbj-studio.com. 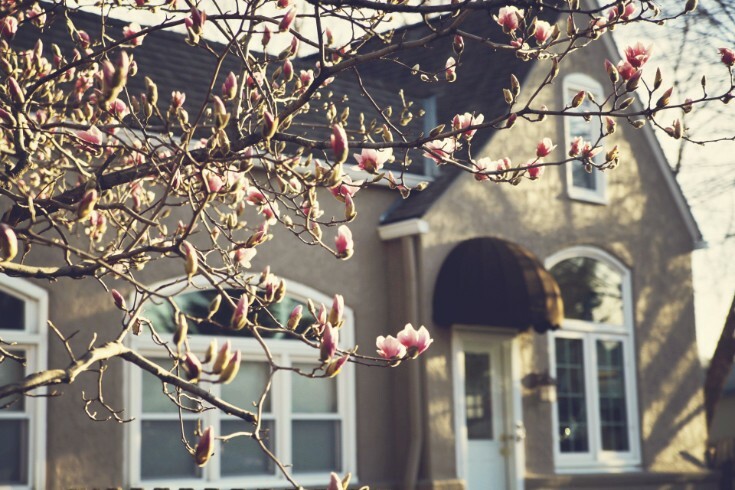 The magnolias trees are blooming out front which gives my heart wings and fills me with hope for a warmer day soon. Have a great day my sweets!